I declare it to be summer. I base that statement on the very real fact that if you can do the same outdoor activity two days in a row without uncomfortable weather conditions, it is summer. The lack thereof of any kinds of weather. Rain, high winds, coldness, big seas, and combinations of such make it unsummer. This chain of not-so-great June-uary weather took a long weekend over the past few days allowing me to get out in my kayak not just once, but two afternoons in a row! The only weather-ish item to greet me on my second outing was a slight northerly breeze that was actually welcomed as it was overly warm, another hint that summer has finally arrived. I was keen to get out there. Not just because of the desire to sit in my boat, but I had spent a week retrofitting the stern end to accommodate a Smart Track Rudder System. The kayak really doesn’t need a rudder. It tracks like a razor through the water. I decided, if reluctantly to add one simply because I am tired of working so hard to ferry across currents and wind the old-fashioned way. I am not as young as I once was. The rudder will not get much in the water time usually, but for those above reasons and the fact that focusing a camera while the paddle is tucked under my armpit to attempt to steer…not easy. I am a believer in paddle skills and after many years without a rudder, I have good skill sets so I don’t owe anything and will not rely on the rudder much, unless conditions require. Wind, currents, combinations of both and perhaps in the next year the flow of the Yukon River at my back. This leads to the subconscious decision-making while I explored the local islands over this lovely sunny beginning of summer weekend. 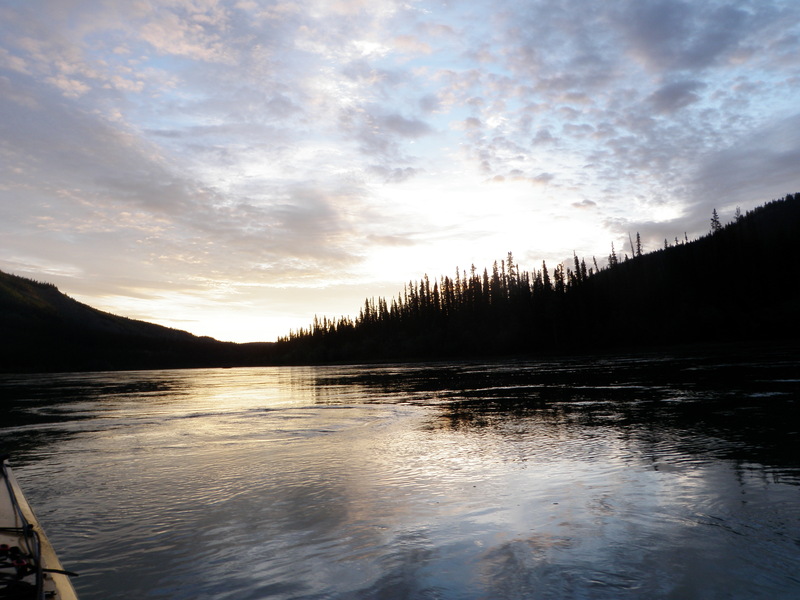 As I worked hard against the tide cursing the fact that the kelp leaves indicated my opposing course against the forces of nature mt mind wandered to fanciful visualizations of paddling the 714km Yukon River Quest Paddling Marathon. I must be nuts! But the addition of a rudder makes any last excuses based on navigation on a river fade away. I find myself thinking more about logistics. Borrowing an extra tent so my wife has a place to sleep at the midway rest stop at Carmacks. What type of food will I have on the route? Making a list of gear I will need and checking it against what I already have on hand. I’m doomed! If I can muster the funds to enter the race next year, I’ll be on the river. Can I finish? Well that is the real question isn’t it. I’d like to think I have what it takes mentally to get from Whitehorse to Dawson City in the require time. I do have a year to prepare and a good friend offering his knowledge and assistance as my crew who has already paddled it, (2 1/2 times) finishing twice and last year winning his class. The list of reasons not to enter are shortening. The Yukon River Quest 2014 edition begins in two days and I see in the roster of paddlers a few familiar names. I wish them well. As for me, I will paddle the summer away. Occasionally checking my speed to see if there is improvements and staying fit. 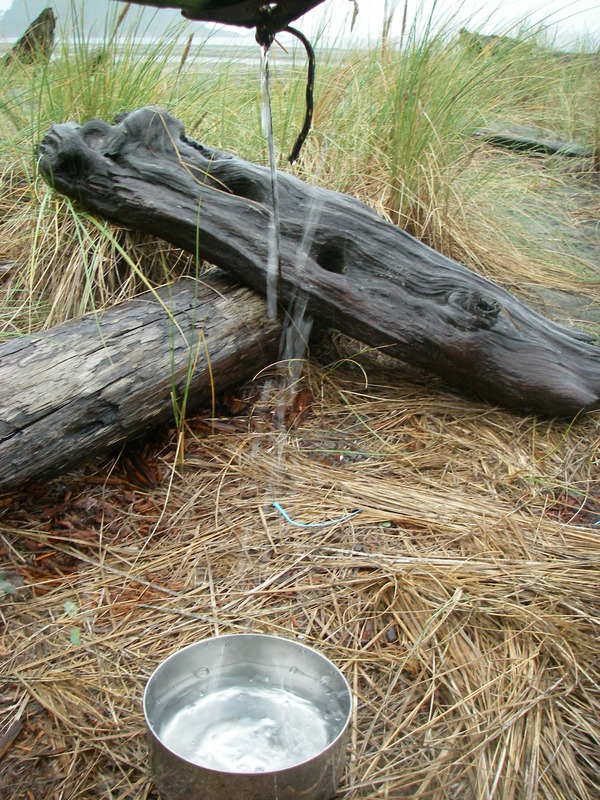 It was only partly agreed upon to break camp the following morning if the weather that had dogged us with rain for nearly the entirety of our two-week paddling trip to Nookta and Nuchatlitz did not relent. Our foursome had been quarreling about intent and agenda and itinerary for much of the journey but now it was taking hold of our collective spirits. Was it time to call it a day? 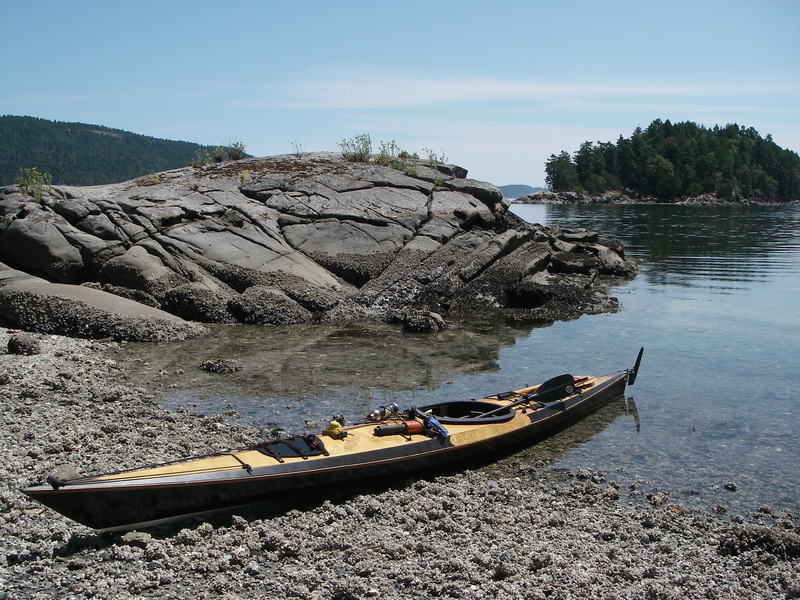 Paddling on the west coast of Vancouver Island is a game of weather fronts and dealing with the forecasts of clear skies and sunshine that never come to pass. It is more a mental game than a physical one as on the stormy days one will, if one is smart stay put in came and make the best of things. The coldest winter paddle I did was in the summer on the coast and drowning was less likely in the kayak than it was in camp. It is called the ‘wet coast’ for good reason. If you plan a trip, plan to bring rain gear. Around the campfire after an adventurous exploring of the cracks, crevasses and what presumed to be called caves on Catala Island we discussed our options. That evening it was warm, dry and pleasant. It had been lovely all that day after the monsoon that had occurred the previous three days finally moved on to drench someone else, someplace else. Our group had regrouped after a brief trial separation to accommodate two differing agendas and when reunited enjoyed a perfect afternoon crossing from the Nuchatlitz group of islands to Catala on emerald-green seas and rolling deep but manageable swells. 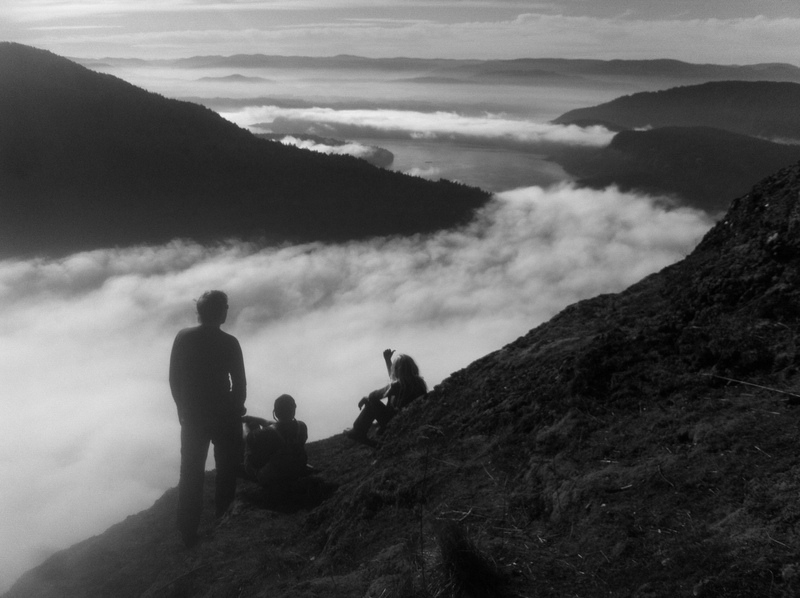 The skies had cleared as had the mood within our group dynamic. The marine forecast given by Environment Canada was dire. Arguably it was not nasty at all where we were but that was not to last. 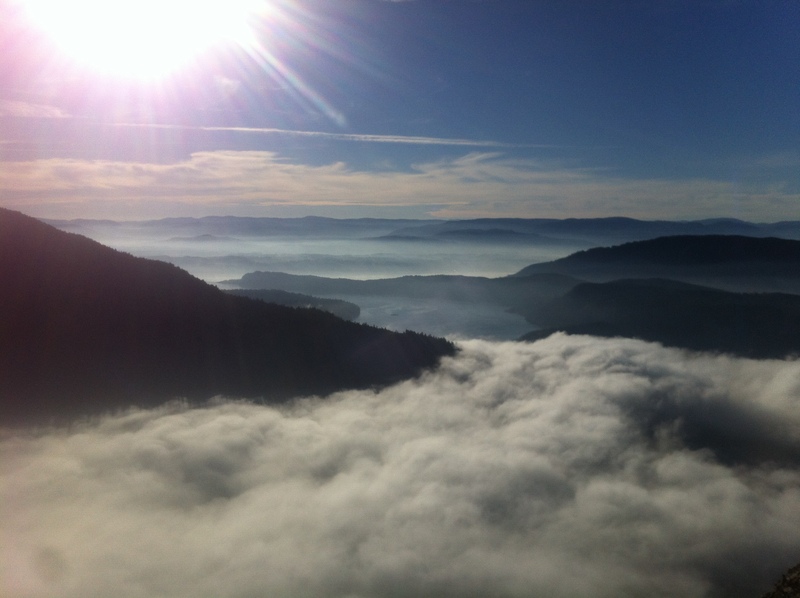 It was decided that we would break up once more into two groups if the weather deteriorated in the overnight hours. There was talk of hunting for fresh drinking water at a falls nearby as our supplies, rainfall or not it was running low. Two of us would head for home saying it was a good trip, but not worth spending another day in the rain foraging for drinking water off tarps, while the others remained to take their chances for another day or so. We retired slowly to our tents and knowing that I might be off early got a head start at packing my gear so all that would be left me was my tent and sleeping bag, and of course the stove would have to cool before being packed. I was not going anywhere without at least a cup or two of coffee in the rain if need be. I was ready and good thing too as around 6 am I peaked my head out of the tent to wet my face in a light shower. My friend who would was the impetus for leaving that day was already in his rain gear and shuffling about his tent pulling pegs. We were going! Within an hour we were sliding out kayaks down the shingle beach of pebbles to the water pecked by small ringlets caused by small rain drops. Hardly the downpour of days before, but enough. We waved good byes and set out. Did we wimp out at the end of a good trip, regardless of crummy weather? Perhaps, but then again we did not endure the storm that would come the day after that hounded our companions all the way up the inlet with hard sideways falling rain, winds and seas to match. Hindsight being what it is, I say that we made a good call to bail early. Perhaps we had run our limit on endurance when it came to being wet hours and hours on end. Still, as my friend slept through the rain storms earlier in the trip and I sat tending a smoky campfire all the while attempting to dry wet driftwood I can’t say it was all that bad. Certainly the warm drizzle that met me in my t-shirt and shorts while enjoying a beer at the back of Rosa Island was not unwelcome. It was a calm day four days before we would leave Catala for good. It was misty in the distance and the barking of sea lions somewhere out there kept me company. The rain on my shoulders and watering down my brew did not change that fact that I was out there in the first place. Rain or shine I was doing something that not many people get to feel and experience. A rainy day spent on the back of some small island that no one knows about. Listening to sea lions and the gurgle of swells rushing up a cleft in the rocks below my pare feet. 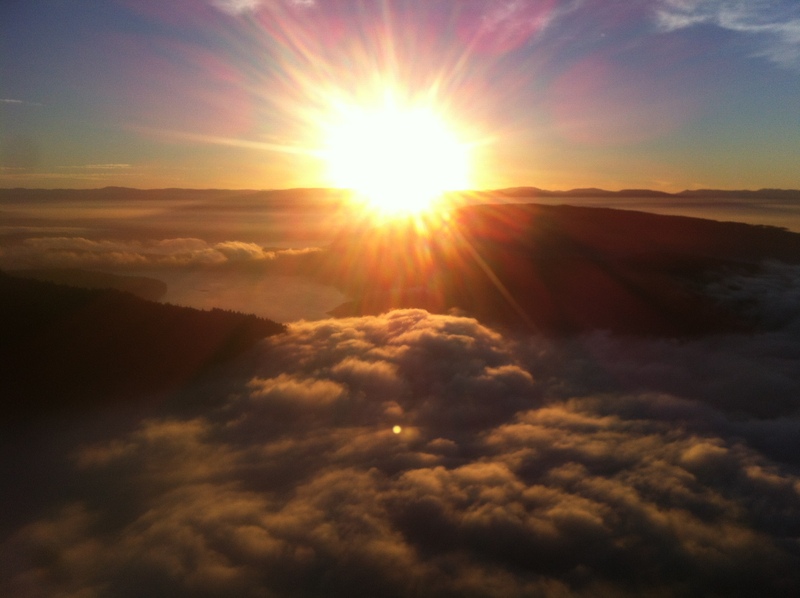 That my friends is camping on the wet coast at its absolute finest. Winter time paddling never felt so good. 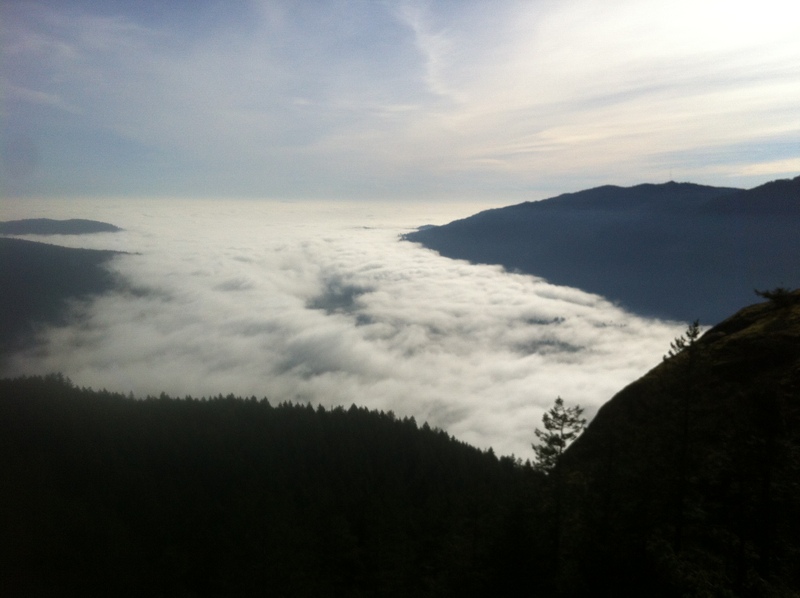 In the past few days there have been repeated warnings of a big winter storm approaching the southern coast of BC. Although, I doubt it will be the storm of the century, there is a knee-jerk tendency out here in the rainy coast to over-react to the news of even a single snowflake at sea level. Being outdoorsy I see this as an opportunity to break out the camp stove in the case of the power outages (snow+wind+tree branches and powerline equations) that often accompany such events. A few candles too, my headlamp and if the power is out for a lengthy period we have cozy sleeping bags as well. Not to worry! Call me a wimp if you like, but the real reason other than the air making my face hurt is that I don’t own the right gear for extreme winter paddling. Most years I can get out there virtually every month as the conditions in January and February are often very conducive to comfy day paddles far from the level of extreme. Perhaps I should label myself as a three-season paddler? That being said, the forecast for some snow by the weekend wakens my desire to have a perfect snow day paddle. To strike calm water with my paddle under torn down pillow clouds leaking snow flakes as vigorously as feathers down and all around me. I have romantic notions as I have never had the experience. I imagine the hush of snow on water as each crystal melts immediately upon contact with mother sea. The silence of it all, which I know from many pre-down walks inspired by being the first other than deer and small birds to leave a mark in newly fallen snow. I imagine the gathering of flakes on my decking. First a light dusting but as the paddle continues its motion through the dark water, the deck changes to a snow-cap. At a distance I hear a gull breaking radio silence and disturbing me for a moment, then all goes quiet once more. The shoreline transformed from recognizable landmarks to alien coast once it is all covered in white. I paddle by a local beach to see a cold but bundled family group walking a large dog who appears to be getting more from the winter’s day than the humans. Another gull crying out marking the time to turn the bow for home. The snow is easing now and breaks in the cloud cover reveal the crisp blue cold above, and the only colour in a monochrome world. It will be near dusk by the time I return to the launch spot and the reality comes of carefully returning the kayak to the car’s roof racks up slippery slopes from the beach. Tick list item done, if only in my mind’s eye. January for most is a month when there is little kayaking going on. Though the sun is shining brightly today the cold winds are blowing and uninspiring me to put my newly renovated wooden kayak back in the water after many months of sitting in the workshop. Instead, January becomes a month of loafing on the sofa with books. 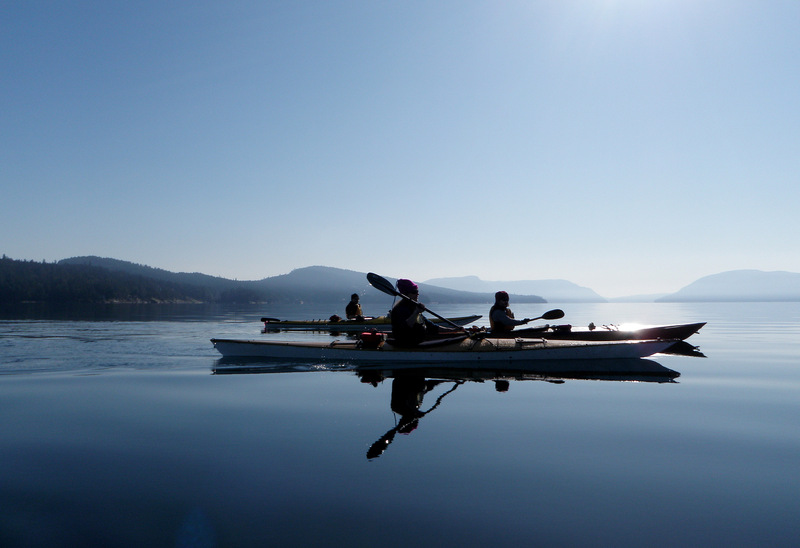 We all have to make time for that activity as it is as rewarding a thing to do as paddling a kayak on a dreamy summer’s day. The reading list as you may have guessed is kayak-related and not all of the books I suggest here are front page news, no hacking off of limbs with pocket knives, no lost at sea epics, no not at all. 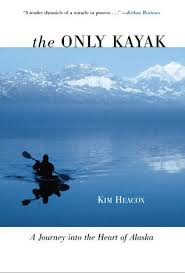 Just books that tell individual stories of relationships with kayaks, nature and something lost as our connection to nature has become over the centuries, our connection to each other. 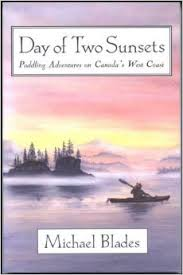 Two books offer very different directions and experiences in solo paddling the inside passage between Vancouver, British Columbia and Alaska. One male voice and one female voice to make things all the more interesting as comparative reads. Then the other pair of books. One, a book of tales both lovely and astonishingly horrific as described by someone entering the new world of paddling to wilderness beaches on Vancouver Island. The other a book in my collection is a memoir, a coming of age and staying put sort of book set under the glaciers of what the author describes as the “Africa of America.” It should be noted as well that these books were either self-published productions or done by smaller press houses. If I were to be inspired to put paddle to the water in the next few days it would be because of Danny Wilks. In the past weeks I have travelled even farther, exploring the Inside Passage from southern BC north to Alaska. I did this trip not just once, but twice in so many weeks. 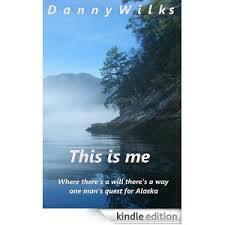 My first journey was with Danny Wilks’s brand new book about his adventures paddling from Vancouver, BC to Alaska. Wilks is a laid-back sort who will tell you his story as if you asked him about his kayaking trip at the pub. Paddling solo with little kayaking experience, a fishing rod, a hammock, the bare essentials, and the will to see if he can do it. 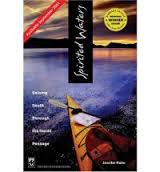 However, my first outing was as reading companion to author Jennifer Hahn who let me tag along on her journey south from Ketchikan, Alaska all the way to her home in Bellingham, Washington in her book, Spirited Waters. Not an easy task as she had made one critical error in regards to the prevailing wind direction. Most paddlers come from the south with the winds at their backs. Undaunted by the challenges she takes the reader deep into nature and the vast history of the coastal community. Part kayaking trip log of a solo woman paddler, and part tutorial from a naturalists point of view this book is a treat. Though, she does get a little touchy feely here and there, her unfolding of the journey is marked with wit, understanding and depicts the inner self of one paddling alone in the wilds.